What is the EWS Continental Series ? Introduced in 2018, the new Continental Series is a stepping stone between Qualifier events and World Series events. These new Continental Series events allow up and coming riders to compete in existing events closer to home and the chance to win a completely new Championship title; North American, European or Asia-Pacific Enduro Champion. Continental Series races also feed into a new Global EWS points structure, allowing EWS members secure a place on the EWS Reserved Entry List and/or a spot on the Trophy of Nations National Teams. The top 3 riders of every official EWS category at every EWS Continental event will also automatically secure a spot on the Reserved List. Only EWS members are eligible to earn Continental Series points and EWS Global Rankings points - or to get a podium finisher's spot on the Reserved List. View the full 2019 calendar here . Event entry is available directly through the individual organizers. 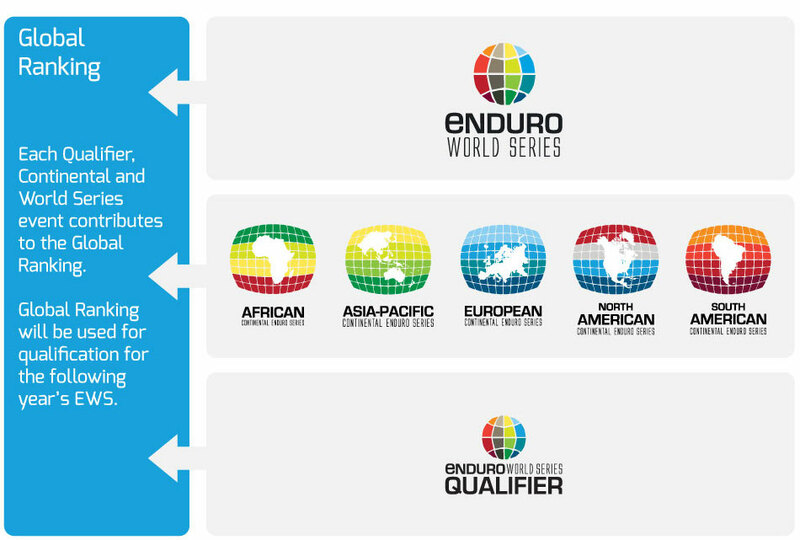 What is the EWS Qualifier series? The Qualifier Series has been designed to allow riders to enter ofﬁcial Qualiﬁer Events around the world and collect EWS Global Ranking points, earning them a place on the EWS Reserved Entry List and/or a spot on the Trophy of Nations National Teams. The winner of each official EWS category in every EWS Qualifier event will also automatically secure a spot on th Reserved List. Only EWS members are eligible to earn EWS Global Rankings points or to get a winner's spot on the Reserved List. Riders must be EWS members in order to be eligible to collect EWS Global Ranking ranking points. Riders MUST have the membership before the race – points will not be assigned retroactively. The EWS only has 6 official categories. As the various EWS Continental and Qualifier Series events do not all use these 6 official categories, EWS Continental and Qualifier Series ranking points are assigned as follows. Riders are sorted into one of the following categories based on their year of birth. Riders with an EWS membership are assigned ranking points for their finish position within that group. Riders who are in the final year of the U21 category will race and collect points in that category. If they secure a spot on the Reserved List, they just select their new age category when they sign up for an EWS race(s) the following season. Same for riders moving up to Masters. Full points tables are available to view in the Rule Book. What is the Reserved List? Reserved List riders will be eligible to sign up for any of the 8 rounds of the 2020 Enduro World Series during the Reserved Entry period (December 2019).